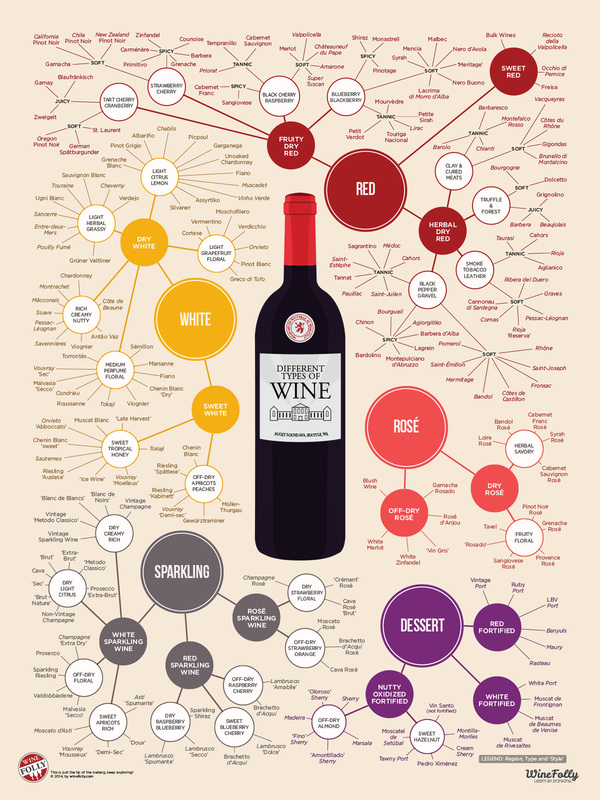 All wines can be organized into five fundamental groups. Within each group there are hundreds of different grape varieties and also different wine-making styles. Still wine made with black grapes. These can range from light to dark and bone-dry to sweet. A still wine produced from green and sometimes black grapes. Flavors span from rich and creamy to light and zesty. Still wine from black grapes produced by removing the skins before they deeply color the wine. Also formed by blending red and white wine together. Both dry and sweet styles of rosé are common. A style of wine-making involving a secondary fermentation causing bubbles! Sparkling wine can be red, white or rosé and can range from minerally to rich and sweet. A style of wine-making involving fortifying wine with spirits. Typically a dessert wine, but many dry-style fortified wines exist such as dry Sherry. ​ Welcome to the Sunset Ridge Winery Product Page. We offer a variety of wines that represent the very best that our winery has to offer. Because our quality control standards are high, we select only the finest grapes for our wines. Our goal is always to deliver superior quality and taste. Your satisfaction is of paramount importance. Below is a list of the products we feature at the winery. Enjoy 5 Samples with our Wine Tasting for only $5! Dry wines, also sometimes called "Table Wines", are wines which do not have an appreciable amount of residual sugar present in the finished, bottled wine. Because they do not have much or any sugar in the wine, they are not sweet. In other words, "dry", when referring to wine, basically means the opposite of "sweet". ​ Leon Millot ~ A medium bodied dry red wine with subtle notes of vanilla and French oak. ​ Frontenac ~ A dry red wine with notes of cocoa and vanilla. A semi-sweet wine leaves a touch of the sugars in a wine usually to complement acidity and/or aromatics in wine. ​ Sweet Leon Millot ~ A semi-sweet red with a soft spicy finish and notes of plum and berry. ​ Sweet Frontenac~ A semi-sweet wine that perfects the unique taste of our Frontenac grapes. Some wines are produced with residual sugar in the finished wine, giving the wine a sweet taste. These can vary from only off-dry to super, sticky sweet. The most sweet are often considered dessert wines as they are often served after a meal. ​ Sweet Rhubarb ~ A sweet twist on a classic rhubarb wine. ​ Sweet Cherry ~ Made from cherries grown in Door County, Wisconsin. This delicious sweet wine makes a great dessert wine. It’s also great for those times when you just want to sip on a full bodied fruit wine. Strong cherry nose and a perfect balance of sweet and tart. ​ Sweet Apple ~ A delicious sweet wine made from apples picked right here in Dubuque County, Iowa. The Apple flavor blends with hints of cinnamon making this a great choice for the sweet wine connoisseur. ​ Sweet Steuben ~ Our most popular wine. This grape makes a delicious wine with subtle pear and apricot notes with a slight floral nose. Great for any occasion! ​ Sunset Ridge Sangria ~ Our version of Sangria served with fresh oranges. *Some of our wines are available at select local retailers. Please check with your local wine department Manager or ask for our wines at your local grocer.